A Canberra group last year helped build classrooms and a computer room in a school in Khara ko Mukh in western Nepal. Photo: Supplied. If you are interested in trekking through the beautiful scenery of Nepal but also providing some practical help for the earthquake-stricken country, then an information night to be held in Canberra next month will give you details of how you can do exactly that. At 6 pm on February 15, the REACH for Nepal Foundation will be holding an information night at The Hungry Buddha restaurant in Belconnen for the Nepal Community Rebuild Trip planned for October this year. 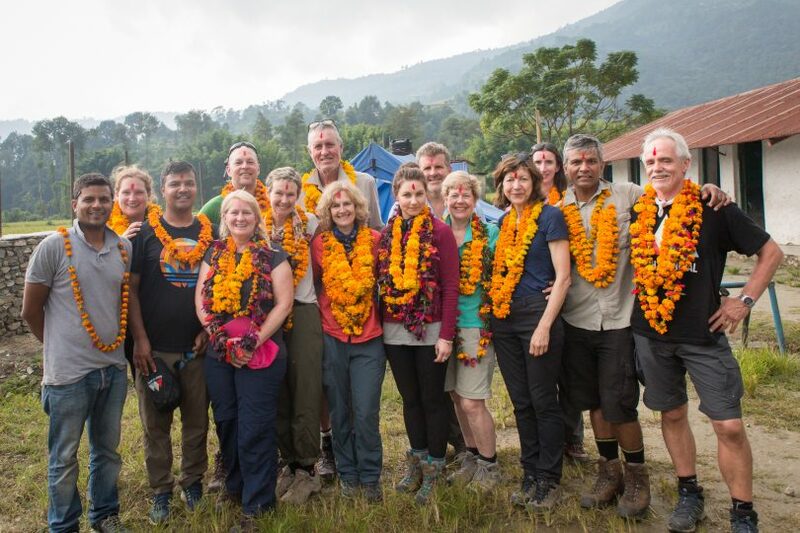 The October trip has been specifically designed to include a two-to-three day REACH for Nepal building project, trekking, and where practical, a regular yoga session. According to co-founder of the REACH for Nepal Foundation – and owner of the Hungry Buddha – Lachhu Thapa, the trips provide an opportunity for people to contribute in a very real and practical way to the foundation’s objectives to rebuild, educate and assist the children and communities of Nepal. Late last year a group of 12 Canberrans went on one of the trips and were able to build two classrooms and a computer room for the Shaheed Hari Prasad School which is located in the remote village of Khara ko Mukh in western Nepal. However, the trips provide plenty of opportunities for exploring Nepal as well – including walking the fabulous Annapurna treks combined with visits to Bandipur and regional Pokhara. Included in the itinerary is also a visit to the Pokhara Valley with its panoramic view of Machapuchare, as well as the Annapurna massif and picturesque Gurung villages. “We experience these highlights while staying at low altitudes where the temperatures remain moderate. The trek pace is relaxed to ensure that the trek is comfortably achievable by trekkers of average fitness,” Mr Thapa said. “There are some challenging sections though, so it is advisable to practice hill walks and steps beforehand. The trips are for two weeks and participants are asked to raise $250 each to support the foundation’s fundraising. For more details including costs, dates and testimonials from past participants attend the information night on February 15. For full details of the information night please click here or if you have any queries email info@reachfornepal.org.